Movie Review: Veteran French filmmaker, Bertrand Tavernier, known for his distinct styles used in films such as “Round Midnight”, “Coup de Torchon”, or “A Sunday in the Country”, directs a comical political satire that has everything to amuse the fans of the genre. The film cleverly adopts the same methods – legitimacy, unity and efficiency - of the mad French minister of foreign affairs that depicts. Legitimacy can be felt when the young Arthur Vlaminck is hired for the invisible ‘language department’ within the minister’s office, accepting patiently the authority of his picky superior. Unity marks the second part of the film when everyone sits down, not only to discuss the best political strategies and speeches, but also to help the minister in his cultural lunches with famous authors, poets, and philosophers. Finally, in the last third, we have efficiency, when all the philosophical theories, nitpicks and stubbornness are left behind in detriment of a short, clear, and pragmatic speech. 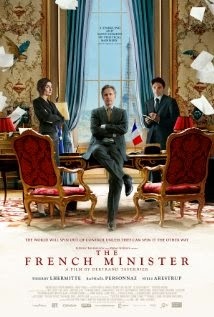 With its tones of mockery and loquacious style, “The French Minister” fulfills its role, becoming closer to Costa-Gavras’ “The Capital” rather than Pierre Schoeller’s “The Minister” whose boldness we could not find here. Don’t expect complex conclusions, since Tavernier abruptly cut irony and sarcasm all at once, but expect to meet the modern ‘Tintin’ of French politics, superbly performed by Thierry Lhermitte. Tavernier took inspiration from the comic book by Abel Lanzac (pseudonym for Antonin Baudry – former minister Villepin’s speechwriter between 2002 and 2004) and illustrator Christophe Blain.